Midwestern fruit and vegetable farmers are more likely than their counterparts in other regions to give up federal organic certification, according to a Purdue University study. Access to organic markets and consumers as well as the demands of obtaining and retaining certification seem to be the most significant drivers of their decisions. Obtaining U.S. Department of Agriculture organic certification can be an expensive, year-long process that requires changing management practices and working with certifiers who determine if farms meet the government's extensive requirements. But that's worth it for many farmers who can command higher prices for organic products since demand has been rising quickly over the last decade. In 2017, organic food sales topped $45 billion—up 6.4 percent from 2016, according to the Organic Trade Association. Sales have more than doubled since 2010. Fruits and vegetables are the top-selling category, making up nearly 37 percent of organic food sales. 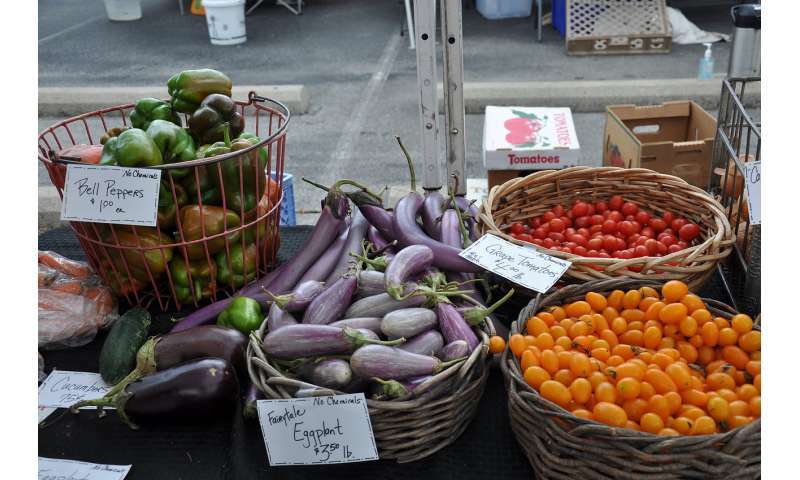 "Consumers are demanding more organic fruits and vegetables, so there is a push to certify more farmers," said Ariana Torres, a Purdue assistant professor of agricultural economics and horticulture & landscape architecture and co-author of the study. "There's been a lot of money invested from the federal and local governments to get more farmers organically certified. The decision to decertify can have an effect on those programs, organic food supply and the bottom lines of farmers who spend so much to get into the program in the first place." Also, many farmers who decide to opt out are likely selling their organic produce directly to consumers through farmer's markets or community-supported agriculture programs. "Your customers know how you farm in those situations," Torres said. "The farmers don't need that tag to say the farm is USDA certified. The farmers just need to have a good relationship with the buyers." "If you're a larger operation or selling to supermarkets, that requires you to be certified organic," Marshall said. "But if you're selling close to home, directly to consumers, you're probably more likely to decertify." "Farmers were more likely to decertify if they perceived that loss of freedom, paperwork, cost of certification, interaction with the certifier, and lack of information were barriers to remain certified. It seems that the requirements embedded in the certification process were detrimental to the decision to remain certified," the authors wrote. "That may be something that lawmakers may want to keep in mind," Marshall said. "We want to maintain as many organic farmers as possible. Maintaining them is a lot less costly than certifying new ones." "If we want to incentivize farmers to remain certified, we probably want to support the access to markets," Torres said. "If you're small enough and can't reach the market, programs that group certified small farms together to get them better access to large markets could be helpful."